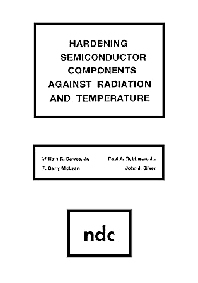 This book describes hardening of semiconductor components against radiation and temperature. Basic mechanisms of radiation effects on electronic materials and devices are discussed first, followed by such practical topics as hardening technologies, circuit design for hardening, and, finally, hardness assurance. Discussions center mainly on silicon technology. Semiconductor manufacturers, engineers, researchers, and management.